Notice how I titled the piece Juliet Macur and not Lance Armstrong. That is because I am a bit tired of the subject. Yes, I watched a bootleg copy of the recent movie The Armstrong Lie. I was left numb and without energy after watching the movie. I also felt disappointed that nothing new was revealed, other than witnessing the movie director being manipulated like everyone else had been. The author of Cycle of Lies, Juliet Macur (bio), is different. She is a highly respected NYT sports reporter since 2004, who has been paying attention to doping and legal issues in sports for a very long time. She studied and observed the destruction and finally has written a book. The result is that she actually has new stories and insight to share. This is the piece that Juliet Macur wrote for The New York Times highlighting her newly released book Cycle of Lies. 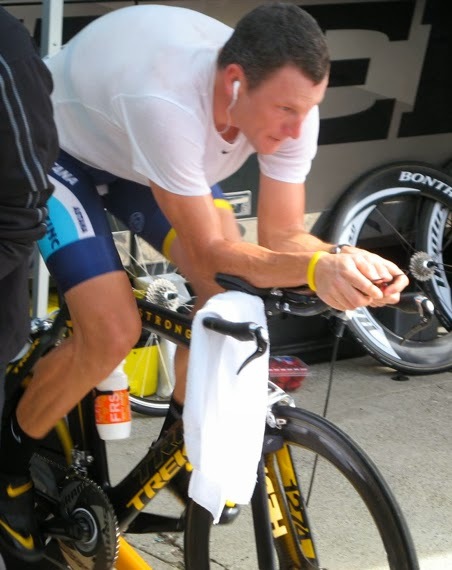 It's free and worth a read: End of the Ride for Lance Armstrong, By Juliet Macur, NYT. Once you read this, you will probably want to read more. I am right there with you if you don't want to spend another dime on the Lance Armstrong topic, but at least you can read these two recent book reviews. The Drug-Fueled Uphill Ride and Headlong Crash of a Secular Saint, By Mark Kram Jr., The New York Times. Cycle of Lies review – Juliet Macur's unflattering portrait of Lance Armstrong, by Tim Lewis, The Observer. Does anybody care about doping anymore? It's all about the gas these days: Giant Shimano and MPCC call for Xenon gas ban, By CyclingNews. Check out this tidbit of ancient doper history - Hamilton, Mayo, Armstrong, Ulrich - on Alpe d'Huez, 4km from the top in 2003 and going a little too fast. I was such a sucker.